This is what I've been working on lately while I'm waiting for Rebecca to fall asleep at night. Jess is easy, she gets a book or two, her nighttime bottle, and then we lay her in her crib, kiss the top of her head, shut the door, and she usually doesn't make a peep again until 7:30 the next morning. Becca, on the other hand, has always been a non-sleeper. She hates the dark, hates the night time. It makes her feel more comfortable knowing her father and I are in the next room, rather than downstairs, so we've been staying up in the loft (which is also our bedroom) until she falls asleep. I love mindless handwork like this, and the I Spy quilt will hopefully be something the girls can play with together. I'm addicted to collecting fabric for it, though, so it's going to be hard knowing when to stop. I've made balls for babies/kids like that made from 12 pentagons. I can't wait to spy it finished! Thanks for showing me that wbsite. They've got some beautiful stuff there. The trouble is my pansies are made out of cheap kids play felt, as opposed wonderful wool felt like theirs! So cute! I just love your projects! I also have one sleeper and one non-sleeper (the boys). It is funny how it works out like that. :o) SuperGirl is a 'tween and would sleep all day if you let her. But...that also means she is a night owl. 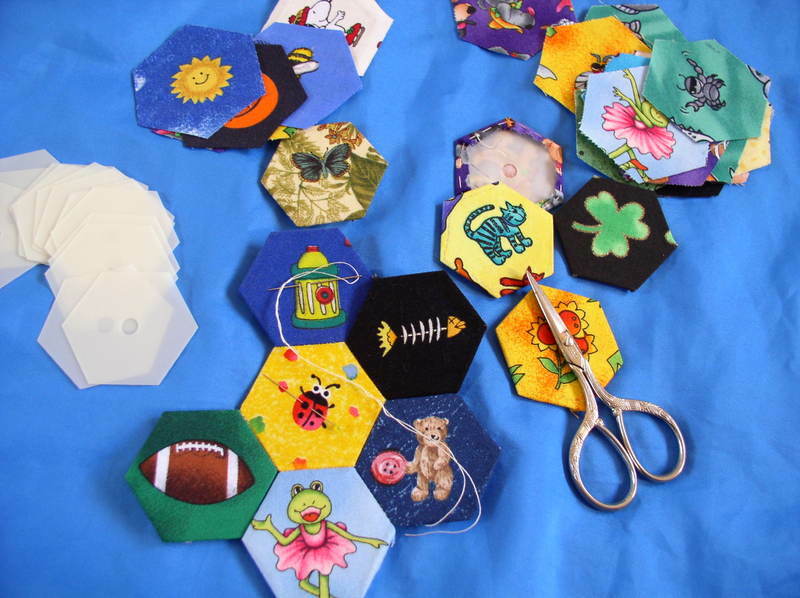 How interesting to do a hexagon eye spy! That is going to look really neat!